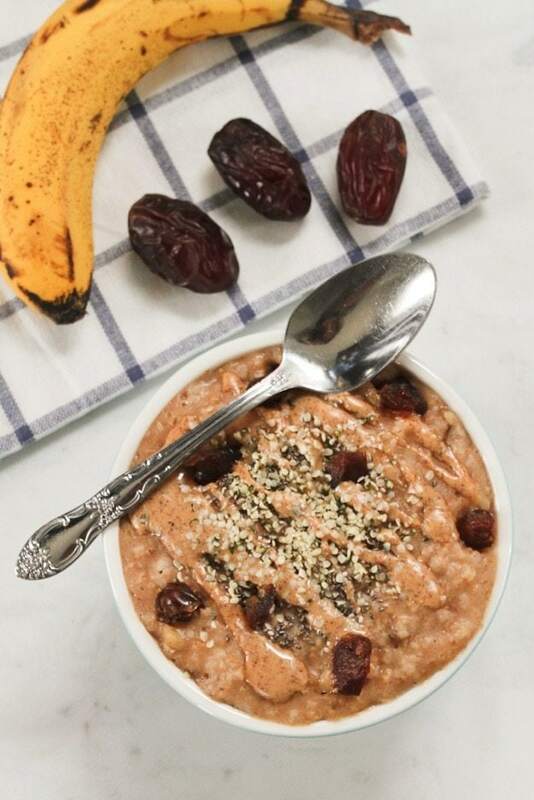 Start your day on a sweet note with this Salted Date Oatmeal, made with hearty steel-cut oats, banana slices, dates, cinnamon and sea salt. I was going to call this recipe salted caramel oatmeal, but I thought it was a little misleading since there’s no actual caramel involved so Salted Date Oatmeal it is! That said, Medjool dates definitely have a caramel flavor and can totally pass for caramel in certain situations. Like in these chocolate turtles — you seriously can’t tell there’s no actual caramel involved. Both the bananas and dates sort of melt while you heat the oats so they get soft, gooey and extra sweet. 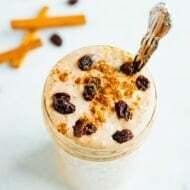 Perfect for those of us that craving something warm and sweet for breakfast but still want it to be on the healthy side. 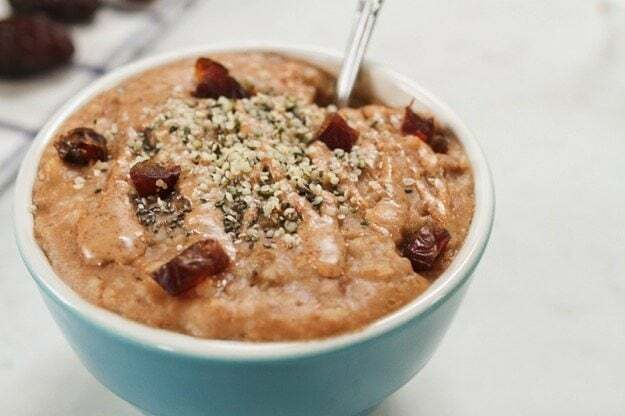 All the sugar in this oatmeal comes from the dates and bananas so it’s 100% natural and the fruit also provides a good amount of nutrition (fiber, vitamins, minerals, etc). Obviously a much better choice than pure table sugar. If you’re watching your sugar intake you can certainly use less of the fruit — maybe only use 1/2 of a banana or skip the banana all together. Just don’t skip the dates because they’re what make this Salted Date Oatmeal. I should also note that I use the overnight cooking method for the steel-cut oats. It’s the same method I use for my creamy steel-cut oats recipe and it’s my absolute favorite way to cook steel-cut oats. It’s really simple and makes for quick reheating. 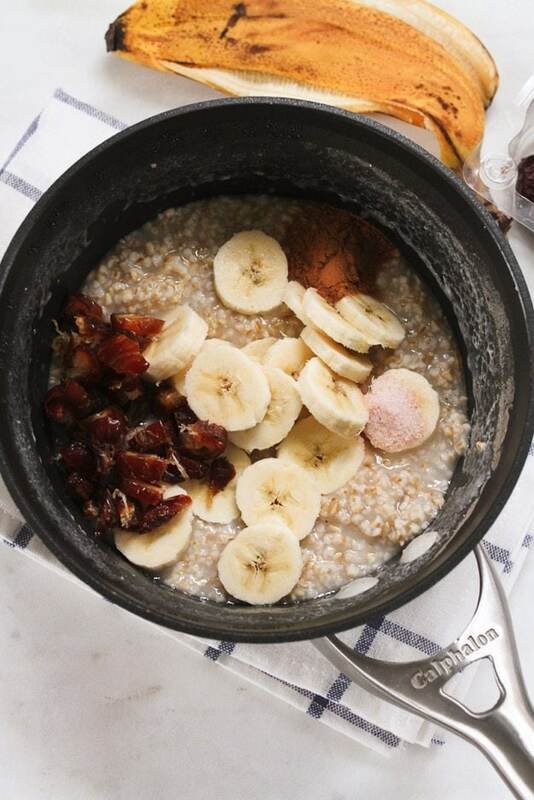 For this recipe you prep the oats the night before and simply add the banana, dates, cinnamon and salt the next morning. Cook the oats for about 5-7 minutes and you’re ready to portion into a bowl, top with your favorite toppings and dive in. 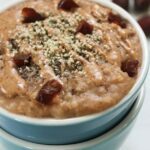 If you’re a fan of salted caramel desserts and/or sweet and savory combos you will LOVE this oatmeal creation. I can’t wait for you to try it. The next morning, uncover the saucepan and stir in banana slices, chopped dates, cinnamon and sea salt. 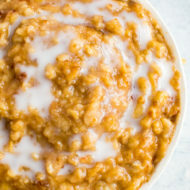 Bring oats to a simmer over medium heat, stirring frequently until the oatmeal is cooked and creamy, about 5-7 minutes. Portion the oatmeal into bowls. Dress with toppings of choice. I used almond butter, chopped dates, chia seeds and hemp seeds. I would devour this! Looks awesome! Oh this looks heavenly! I love anything salted caramel. 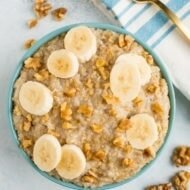 Add in oats and it’s even better! Mmmm these look so creamy and delicious! Dates really are nature’s perfect candy. I love them in oatmeal! Yum, this looks delicious! I’ll definitely be trying this recipe out! Would it still work if I use quick oats? Totally! Although you won’t need to cook the oats the night before and you won’t need to use as much water. Just follow the cooking and water instructions on the package and simply add the banana and dates while cooking. 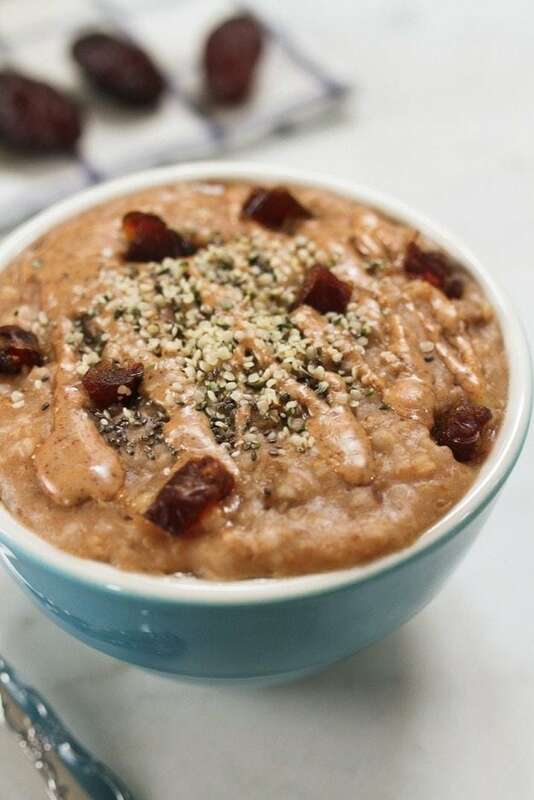 The banana slices and dates might not “melt” and get as creamy as they would with oats that take longer to cook, but they’ll still taste good. 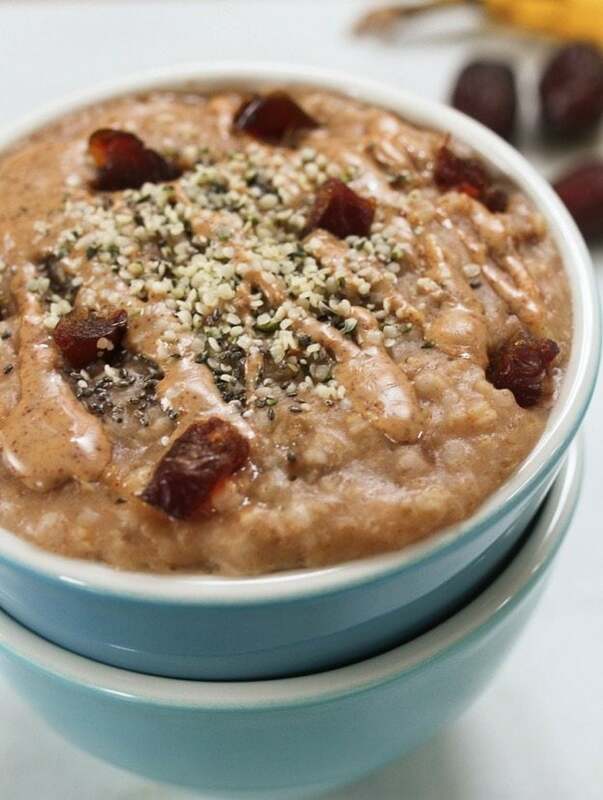 I love the combo of dates, almond butter & hemp together — one of my favorites for sure!! Hi Brittany. I plan on using regular old fashioned oats instead of steel cut……is the water to oats ratio the same or should I use less? This looks delish! Some of my favorite food flavors in one happy breakfast! Thanks! This looks amazing, great list of ingredients. Thanks! Now this looks like a breakfast that will fuel me through my morning! Delicious!! I am indeed a fan of salted caramel and date caramel as well! Looks yummo! ? I’m out of steel cut oats. 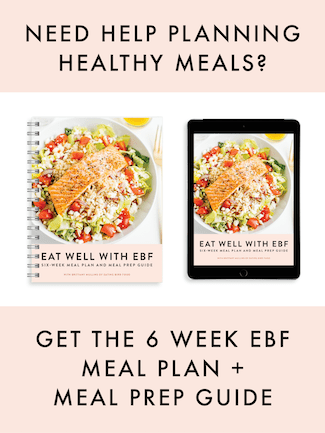 Could I use oat bran instead?